We’ve all heard and read the accounts of how much Charlie hated the cold—insisting on leaving Essanay Studios Chicago after only one month (January 1915) at the hands of old man winter on Lake Michigan or burning his traditional coals in the fireplace at Vevey even in the summer months. Lesser known and retold are the accounts of Charlie making the most of nature’s winter assets. 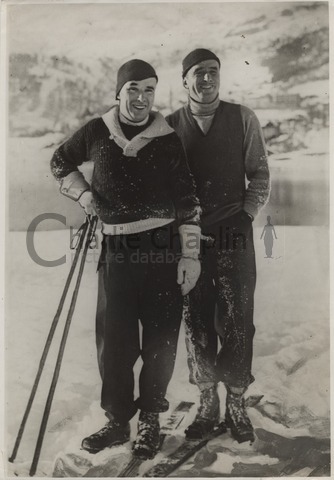 I keep returning to the European tour of 1931-2 because it seems like so much BEGAN for Charlie on that trip—social consciousness, coming to terms with sound, writing as a creative endeavor and even the beginnings of a tentative appreciation for winter sports, especially skiing. While Charlie seems to have developed some proficiency in skiing during this stay in St. Moritz, it’s surprising to find out, given his documented roller-skating expertise, that he was not so good at ice skating. 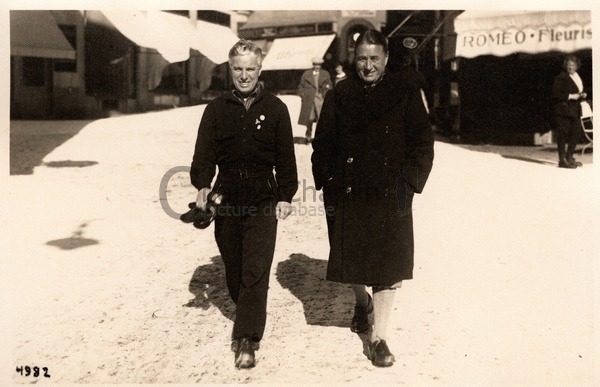 Polish opera star Ganna Walska, in her memoir Always Room at the Top (1943), recounts meeting up with Charlie in St. Moritz: “an after-dinner philosophical conversation with Charlie Chaplin easily compensated for the shortness of the day. And I had as a flirt the handsomest man Great Britain has produced! He was so very handsome! And his mentality did not overtire him at all! Wonderful—there was no possibility of getting into a discussion with him. We skated together. He skated badly but his skating suit was so becoming to him” (330)! 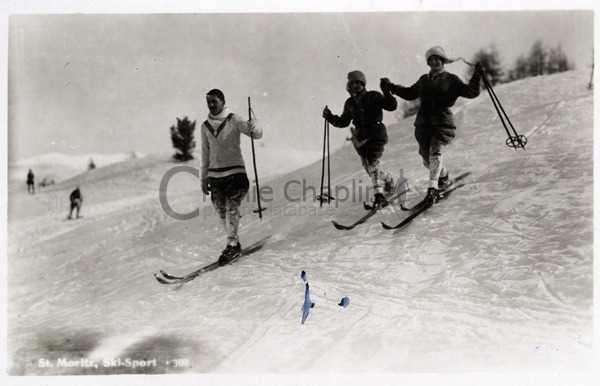 St. Moritz in 1932 proved to constitute the apex of Charlie’s winter sport expertise. It is known that he traveled to Yosemite, California on occasion with either Paulette Goddard or Douglas Fairbanks or King Vidor to ski there—in one instance regaling the return bus-load of winter sport enthusiasts with his bull-fight performance when their progress down the mountain was delayed due to a nasty storm—but, as Michael Chaplin relates in the new documentary Chaplin: The Forgotten Years, Charlie’s skiing expertise had deteriorated by the time he began taking his family skiing in the Alps in the early 1960s. 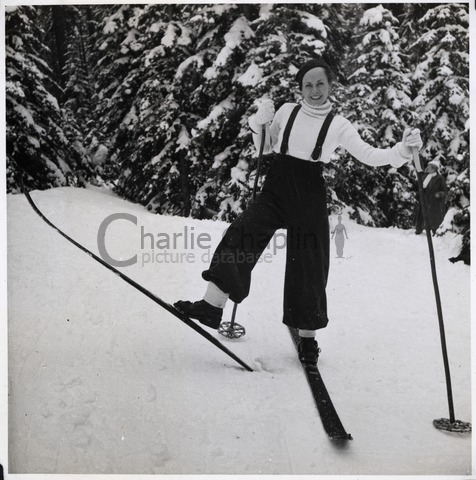 Still, perhaps the first image that comes into our minds as Chaplin admirers concerns none of these instances, but rather the image of the Little Tramp in The Gold Rush, skiing without equipment down a short expanse of hill near Chilkoot Pass. Winter sport in Truckee, California in April 1924 involved a whole different set of skills and strategies.